Jim Rearden is an incredible writer. 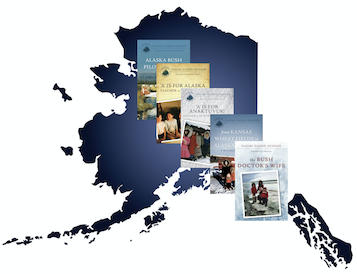 His word choices, descriptions, years in Alaska, and respect and love for the people and history of Alaska show through in his captivating stories. 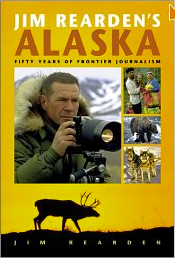 His style reads like a friend sitting down with a cup of coffee and starting a conversation with, "You know, I was talking to ol' Knut the other day and he told me about when..." Unlike his other books, this one has chapters of individual true-life stories, often excerpts from his published articles in Outdoor Life, Alaska magazine, Alaska Sportsman, and other publications. 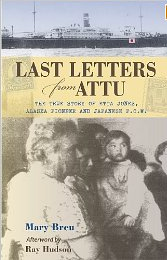 What isn't known until the book is opened is that Etta was a pioneer school teacher in Tanana, Old Harbor, Kipnuk, and Attu (starting in 1922.) I was particularly fascinated by her time in Tanana, since our family was there in 1957. Later, when she taught at Kipnuk, with the Yupik Eskimos, her observations and teaching challenges in 1932 were remarkably similar to Anna Bortel's ('A' is for Anaktuvuk : Teacher to the Nunamiut Eskimos) in 1960. Her story doesn't end with those adventures, but takes an unbelievable turn when she becomes a P.O.W. There are more than 33 states represented in the "More than Petticoats" series. Of course I was interested in Alaska Women, and more so since I'd just eaten the best hamburger at Seward's Alaska Nellie's Roadhouse. After reading the book, I found author Cherry Lyon Jones on-line and sent her an email. Our friendship sprouted. In 2012, we shared dinner at Land's End restaurant in Homer, Alaska. In 2013, she invited me to stay at her house during the Kachemak Bay Writers' Conference in Homer. Her book was an inspiring read for myself and has become a gift to friends and family. I have the first edition, published in 1942. I must have brought it back from the Gaede-80 homestead. It has little pencil notes in it that I think are my sister Mishal's. Mishal's birth mother was Inupiat Eskimo from Point Hope, and this book is about the author's early exploration up that coast line -- and on past to Barrow. Fascinating history in story-form: whaling boats, coal exploration, relationships among the various groups of Natives. The author's sense of humor adds to the pleasure of reading his adventures. When the rugged Alaska Highway opened to the public in 1948, there were few services and facilities. In 1949, the first Milepost was published to provide vital facts and practical information for the traveler. Today, the Milepost provides mile-by-mile descriptions of the highway, geography, accommodations, gas, and businesses. Want to know the number of people per square mile in Alaska? The coldest recorded temperature? Where to hike? If you're a cheechako? Visitors and Alaskans alike enjoy the impressive facts, figures, and activities of Alaska, presented through the wisdom, wit and wackiness of Mr. Whitekeys. The Almanac has been published annually since 1976. Dr. Albrecht arrived in Alaska during the Great Depression. The sole physician to a remote colony of farm families in Palmer, he not only delivered babies, treated diseases, and performed surgery, but he became Alaska's first full-time commissioner of health. He all but eradicated tuberculosis, taught nutrition and sanitation in remote villages, and won the right for Natives to be treated at Alaska hospitals. During the 1950s, when Doc Gaede was stationed in Tanana, Andy Anderson, was a bush pilot at Beetles Field, Alaska. Andy worked for Wien Airlines, carried mail, delivered miners to their claims, and dropped off hunters. He was dedicated to caring for all people along the Koyukuk, Atlanta, and other rivers; oftentimes he risked his life to get the medical treatment they needed — which meant flying them to the Public Health hospital in Tanana. Not only will you experience the close-calls of Andy's bush flying, but you'll appreciate his sense of humility and kindness as he gave generously of himself during an era when bush flying was a critical lifeline. When Hannah Breece came to Alaska in 1904, it was a remote, lawless, wilderness of gold prospectors, murderous bootleggers, tribal chiefs, and Russian priests. She spent fourteen years educating Athabascans, Aleuts, Inuits, and Russians with the stubborn generosity of a born teacher and the determination of an independent spirit. If you love dogs, this book is for you! If you delight in watching the human spirit desire and accept a challenge, this book is for you. DeeDee Jonrowe is one of the best known mushers in Alaska. She is a consistent top ten Iditarod finisher. Her inspiring story is one of determination, hard work, commitment, physical strength, hope, and adventure. This book confirms that huskies were made to run, as much as Golden Retrievers were designed to retrieve and German Shepherds to herd. This book, and other books about the Iditarod, is a testimony of the lead dog's uncanny and astonishing ability to sense and scent the trail. Every chapter illustrates the love and care of the dog musher for his and her dogs through careful placement of the dog in a position that is suitable to its abilities, diligence in the dog's physical well-being, and knowledge of its uniqueness. When a deadly diphtheria epidemic swept through Nome, Alaska, in the winter of 1925, the local doctor knew that without a fresh batch of antitoxin, his patients would die. The only mode to obtain this lifesaving drug was by dogsled. The heroic dash of dog teams across the Alaska wilderness inspired the annual Iditarod Trail Sled Dog Race. Alaska holds title to the most seismic of all U.S. states — and has 11 percent of the world's earthquakes. This pictorial history records the devastation of the "Good Friday" in Alaska, as well as providing geological explanations and specific geographical effects. The second half of this feisty and humorous book takes place in Kenai, Alaska, beginning in 1948. Many of the early homesteaders, businesses, and activities the author describes were familiar to Doc Gaede when he arrived in the nearby town of Soldotna 1961. Subsequently, this information provides the reader with a broader backdrop of the cultural, history, and environment of chapters 19-24 in Prescription for Adventure: Bush Pilot Doctor. Written from diaries, letters, memoirs, newspaper accounts, and archival photographs, this lively works explores the critical roles women played during the gold rush as entrepreneurs, miners, teachers, doctors, nurses, and journalists. Alaska Earthquake 1964 - Where were You? The one thing that shook them apart, brings them back together to tell their true stories 32 years later. On July 14, 1958, "Father of the H-Bomb" Edward Teller arrived in Alaska to unveil Project Chariot, a plan to carve a new harbor out of the Alaska coastline at Point Hope by detonating up to six thermonuclear bombs. Teller and other members of the Atomic Energy Commission (AEC) propagandized to the Native people, and other Alaskans, that little effect would take place on their physical health, wildlife, environment, or subsistence lifestyle. This is a captivating and disturbing documentary of projects both intended and carried out by the AEC. Point Hope is the the village of Mishal Gaede's biological family. Her grandfather, Andrew Tooyak, Sr., is featured in one of the centerfold pictures. The story of Mishal's adoption into the Gaede family can be found in Prescription for Adventure: Bush Pilot Doctor. Amos Lane is in the same picture. Elmer Gaede visited his home in Point Hope when his son, Leonard Lane, took him polar hunting. This story can be read in Prescription for Adventure: Bush Pilot Doctor. Mark Obmascik's account of his quest to climb all of Colorado's 14,000-foot peaks. This book explores this dark side of climbing. When an accident happens on a 14er, the victim is far from help and in an environment where rescue is difficult at best. The book is full of hair-raising stories of these disasters and rescue attempts and also aids in avoiding such disasters. Krakauer's epic account of the May 1996 disaster on the summit of Mt. Everest. Talk about adventure! These girls had no idea they were part of an adventure. They did not know they were making the world's first nuclear until a bomb detonated above Hiroshima. What were they thinking? How did they stay on their job with no information about what they were working on? How were the secrets in this compound contained? Sometimes we can stumble into adventure and not even know it's happening to us. For most of my life, I've read about the Western Front of WWII in Europe. The past several years I've sought out accounts of battles in other parts of the world. This book introduced me to a startling mission in the South Pacific, which included both men and a woman; and to a previous-to-that-time, unknown society. A plane crash, language barriers, culture, survival, and climate all added to my amazement. This was an account of WWII in the Philippines. What had been a tropical paradise, turned into a horrifying nightmare. Nurses set up field hospitals in jungles and tunnels. There they tended to devastating injuries of war, while experiencing the terrors of shells and shrapnel. As if that wasn't terrifying enough, they were taken to internment camps where they endured three years of brutality and starvation.